Governments' promise for sustainable development is questioned by the manner in which they are chasing a mega free trade agreement which in its current form, will exacerbate inequities and injustices on the ground. This mega free trade agreement, formally called as Regional Comprehensive Economic Partnership (RCEP), is currently being negotiated in Hyderabad, India despite growing protests by several marginalized communities, especially women's groups. At a rally held in Hyderabad, women from different parts of India marched along with other marginalised communities to protest against RCEP. 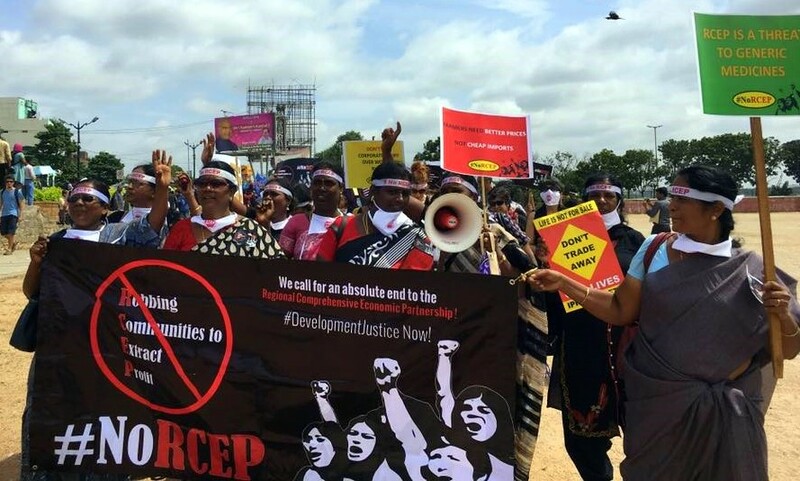 Women who staged a fierce protest against the RCEP came from groups working on issues related to farming, Dalits' rights, land rights, national resource rights, indigenous women's rights, minorities, fisher women's, labour rights and other human rights. Is RCEP reinforcing destructive development model? These women groups conveyed a strong 'No to RCEP', because it is a reinforcement of the destructive development model that the existing free trade agreements and the policies of liberalisation, privatisation and globalisation have inflicted upon the world's poor. Such a destructive model has only fueled the inequities and have had the severest impact on marginalized communities, especially women. Burnad Fatima from Federation of Women Farmers Rights, Tamil Nadu and Asia Pacific Forum on Women, Law and Development (APWLD) member said, "Women farmers are going to be the worst affected by this free trade agreement. Land grabbing for corporate agriculture will impact our food sovereignty, rights over our land and seed preservation. It will force women to migrate to seek labour and become vulnerable to trafficking." "RCEP and other similar free trade agreements are in reality the legal contract to give rights to multinational corporations to destroy traditional livelihoods and lifestyles of indigenous communities. Indigenous women as the tradition keeper of their community's local knowledge, seed, biodiversity and food sovereignty will lose their control as RCEP will put these knowledge and biodiversity into the hands of corporations under the guise of intellectual property," said Banamallika Choudhury, women's rights activist and APWLD partner. "It is deeply concerning that this trade agreement directly impacts women, but is not being discussed in the Parliament, State Assemblies, or at Panchayat and Municipality levels," said Albertina Almeida, APWLD member and an activist and lawyer from Goa. It is worrying that negotiations which have a bearing for the people/ communities, are conspicuously shrouded in secrecy, she added. Kate Lappin, Regional Coordinator of Asia Pacific Forum on Women, Law and Development (APWLD) added, "The RCEP and other trade agreements give multinational corporations the right to govern at the expense of women’s livelihoods, the environment and democracy. A system that allows corporations to sue governments when they attempt to regulate corporations, protect the environment, provide public services or protect public health is a corporatocracy, not a democracy. Women have been at the heart of the movements to stop other trade agreements like the Trans-Pacific Partnership (TPP) and to halt the deadly advances of the World Trade Organization (WTO). We will use the same solidarity to stop the RCEP. " The women's groups urge the Indian government to stop negotiating a trade agreement based on US model of corporate trade and move to a people's trade agreement that truly advances development justice. Will RCEP push us backwards on #SDGs? Our governments have agreed to deliver on the UN Sustainable Development Goals (SDGs) by 2030 but the trade agreements like RCEP threaten to not only reverse the gains made in advancing towards the 17 SDGs but also worsen inequalities and injustices - severest impact of which will be faced by the most marginalized communities, including women. Countries negotiating RCEP must not push for intellectual property (IP) provisions that expand and introduce new monopolies for pharmaceutical corporations, undermining generic competition that is critical for lowering medicine prices and ensuring access to affordable medicines for procurers, treatment providers and patients. "Millions of people globally are counting on India to continue to stand firm and resist dangerous provisions that represent a matter of life and death for those in need of treatment," said Loon Gangte, International Treatment Preparedness Coalition (ITPC) South Asia. "India has been through this before with the EU-India trade agreement where similarly harmful provisions undermining access to medicines were either withdrawn or dropped. The country needs to stand firm again." Among the proposed harmful measures, are possible rules that could allow multinational pharmaceutical corporations to sue RCEP governments for millions of dollars when they take steps to lower the price of medicines. These rules could also extend patent monopolies beyond even the current mandatory 20 years, and also force the sale of generic medicines to be stopped based on mere accusations of patent infringement – even if these accusations are unwarranted. Taken together, these provisions represent an aggressive push to lengthen and expand multinational pharmaceutical monopolies, which will restrict and delay price-lowering generic competition for longer periods of time. This, in turn, will result in high prices for the medicines people need to survive. "We rely on affordable medicines made in India to treat people in our medical programmes in more than 60 countries around the world, who are living with diseases such as HIV, tuberculosis and hepatitis C," said Leena Menghaney, South Asia Head for MSF’s Access Campaign. "We are standing up now like we have before when we see a threat to our source of affordable medicines, because we simply cannot afford to stand by idly. We urge India to resist any pressure to accept provisions that could cut the future life-line of needed drugs for millions of people the world over." MSF and the other public health experts also expressed deep concern that Japan and South Korea are demanding ‘data exclusivity’ in the negotiations, which would block other manufacturers from the market for at least five years by restricting regulatory approval that is needed to prescribe or procure generic medicines. This back-door route for drug corporations to get a monopoly for medicines that are already off patent represents a serious threat to people’s ability to afford the treatment they need to stay alive and healthy. Many countries that have accepted excessive monopolies on pharmaceuticals are now grappling with the consequences of unaffordable medicine prices. For example, in the United States, prices of patented cancer medicines have almost doubled from a decade ago, averaging from US$5,000-10,000 per month, while a new hepatitis C drug was introduced at the price of $1,000 per pill. Since 2012, the RCEP trade agreement has been under negotiation between the ten members of the Association of South East Asian Nations (ASEAN) members (Brunei Darussalam, Cambodia, Indonesia, Lao PDR, Malaysia, Myanmar, Philippines, Singapore, Thailand, Vietnam) and the six countries that have existing trade agreements with ASEAN: Australia, China, India, Japan, New Zealand and the Republic of Korea. Notably, the RCEP countries are home to nearly 50% of the world’s population, which include some of the most impoverished and marginalised communities.